The Money Shop is a trading name of Instant Cash Loans Limited. Offering a range of financial services, including instalment loans, pawn broking and gold to cash, they operate hundreds of high-street stores across the UK. You can visit The Money Shop in person, contact them by telephone or access a loan through their recently updated website. Update: As of 2018 they no longer offer short term loans on their website. What is the duration of a The Money Shop loan? Instalment loans from the Money Shop are offered for between three and 12 months. You may apply for between £100-£2000. The amount that you are offered depends on your loan affordability, which is calculated based on information supplied in your application form and held in your credit file. What is The Money Shop’s loan application process? 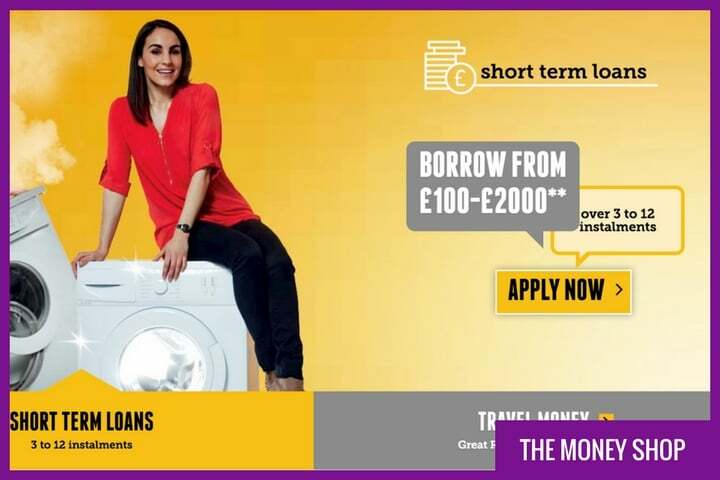 Select your preferred loan amount and duration and then you may apply by telephone, by calling 0800 009 3565 or completing the simple online form on The Money Shop website. During the application process, you will be asked for an address history and financial information, such as income and monthly expenditure. You are also required to supply your bank details. If approved, you will be presented with up to six loan offers, based on the loan amount that you originally requested, and their assessment of your affordability. This enables you to select the loan that best suits your financial circumstances. Read and then electronically sign your loan agreement if you wish to go ahead. The Money Shop must receive this by 3 pm for same day bank transfers. How quickly will I receive my loan from The Money Shop? Deposit times run 4 am to Midnight, on the hour, daily. What do The Money Shop charge? Daily rates range from 0.36% to 0.64%, depending on the loan duration that you select, which means you will pay between 36p to 64p per day per £100 borrowed. Do The Money Shop charge penalties? The Money Shop don't charge any fees or penalties, even for missed or late payments. Can I repay my The Money Shop loan early? You can always repay your Money Shop loan early, meaning you only pay interest for the time you borrow, which reduces your daily interest charges and therefore total cost of the loan. Will The Money Shop run a credit check? The Money Shop are a reputable lender, who are accredited by the Financial Conduct Authority (FCA) and so they will run a credit check as part of your loan application process. If you are concerned that you have less than perfect credit, then it is recommended that you check your credit file with the main credit reference agencies before making your loan application. What help and support do The Money Shop offer? If you have or are planning to apply for an online loan then you can contact The Money Shop Online Customer Service team on 0800 009 3565. They are available from 8 am to 7 pm Monday to Friday, 9 am to 4 pm on Saturdays and 10 am to 4 pm on Bank Holidays. You can also view or complete your loan application by logging into your online account. Where can you find online reviews of The Money Shop? The Money Shop works with business review platform TrustPilot to provide genuine reviews from previous customers. There are currently over 2000 reviews on the site, with an average rating of 9.2 out of 10 for customer service, which places them in the ‘excellent,’ category. What are The Money Shop's FCA registration details? The Money Shop is a trading name of Instant Cash Loans Limited who are authorised and regulated by the Financial Conduct Authority under registration number 681750 on the Financial Services Register. Applying through CashLady involves just one simple application and then we’ll supply you with a selection of suitable quotes from various providers, including The Money Shop.